Toronto Star news reporter Patty Winsa, wrote the following article about the challenge Toronto condo developers face when trying to build a project over a noisy subway line. This is an ongoing challenge for Toronto condo builders, as many of the city’s best locations are on or near the subway lines. A rubber insulation system, inspired by the type used by architects Diamond Schmitt in Toronto’s Four Seasons Centre to give opera-goers a pure experience of the music, will ensure subway noise is no bother for residents. About half the parking garage, closest to the subway, has been constructed on an expensive Belgian-made system that uses steel-encased rubber to isolate and reduce vibrations at the base of columns. 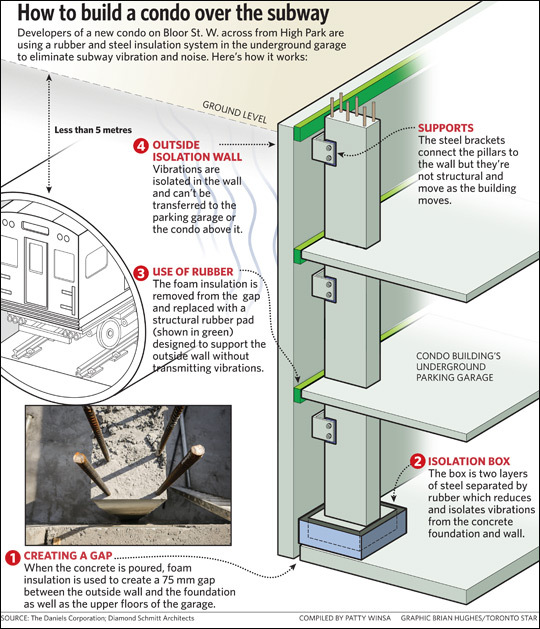 Instead, vibrations from the subway will move up an outside concrete wall that will be isolated from the top and bottom of the garage by a 75 mm gap. The system will mediate any ground movement, even from a minor earthquake. “The pads wouldn’t know the difference between that vibration and subway vibrations,” says Sam Tassone, vice president of The Daniels Corporation. The technology has been used by other developers, but it’s the first time Daniels has tried it in a residential building.